Super Bowl 2012 - CBS Sports brought the world renowned Rebirth Brass Band into Dubway to impart their New Orleans funk to this year’s Super Bowl. They rendered their own inimitably funky version of the CBS Sports theme, bringing a flavor of the Big Easy to the TV broadcast and pre-game build up. 40 Million listeners! Linda Purl, television actress (True Blood, Desperate Housewives), cabaret singer, movie and Broadway star, came to Dubway’s Mezzanine to record her new cabaret cd. Lee Lessack, founder of LML Music, and a famous vocalist and recording artist in his own right, produced the sessions. Eric Hutchinson performed at the City Winery, and Dubway’s remote recording team was on hand to multitrack the live show, and subsequently mix it, complete with all the live show banter that endears Eric to his fans that packed the house. World famous classical violinist, Joshua Bell was interviewing with radio stations across the country from the Dubway’s Blue Control Room, announcing his conductorship of Academy of St. Martin in the Fields, as well as his new album of Beethoven Symphonies No. 4 & 7, with the same orchestra. Dubway’s production audio teamed up with PBS station WGBH for a film recording of famed mezzo soprano Renée Fleming - in a Fifth Avenue apartment, accompanied by a quartet of guitar, cello, violin, and piano. The shoot will air as part of longtime culinary show, Lydia’s Italy. 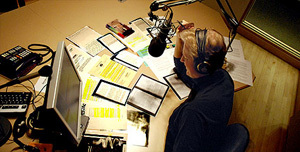 In December, Dubway Studios hosted a radio broadcast of the syndicated radio show, On Point with Tom Ashcroft. Classical pianist John Davis was interviewed, live on the air, by Tom Ashcroft in Boston’s WBUR, and performed piano compositions by Abe Lincoln’s favorite contemporary American composer, Louis Moreau Gottschalk. Rudolph Buchbinder, world renowned classical pianist, came to Dubway to connect with a dozen radio stations for interviews about his forthcoming Mozart recording on forte piano.